SKU: Model: TCU. Category: Control Systems. The Traffic Control Unit (TCU) can be used as an application for control from either PLC or PC. For PLC control a PLC with six digital inputs and eleven digital outputs is required to control all features on the unit. For PC control a USB is fitted, allowing control from either the supplied software or programing software compatible with the USB interface. The TCU represents a typical crossroads junction controlled by two pairs of traffic lights together with a pedestrian crossing on one approach. 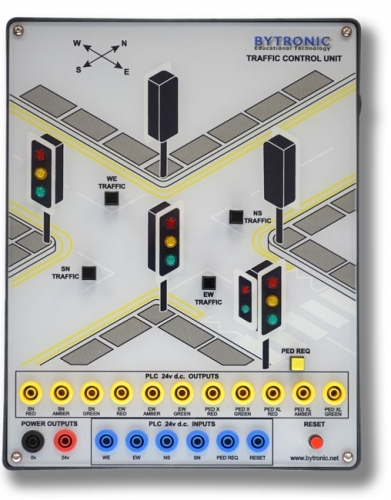 The TCU features a clear mimic of a traffic junction with the lights and pedestrian crossings represented by LED’s in the appropriate colours. Four buttons are used to simulate vehicle sensors built into the surface of the road and represent traffic flow. Further buttons are used to control the pedestrian crossing and a reset signal. The Acrylic front cover protects the electronics and the mimic from damage. The TCU is supplied with a manual that includes a user guide, courseware suggestions and solutions to the exercises. USB or IDC connection supplied as required.